Several months ago, I was at a party and I started talking to someone I had never met. After exchanging pleasantries (not my forté) we moved on to families, professions, the normal small talk kind of thing. When I intimated that I wrote a wine blog, the floodgates opened. His first few questions were rather easy to answer as he wanted to know everything about the blog, the type of wine I like, and my favorite wineries and regions. Since I loathe talking about myself (I already know a lot on that topic, and I find it rather boring), I fed him some well-rehearsed lines and was ready to move on. Then he asked about my writing style. He wanted me to describe my writing style to him. The “Natural Wine” debate is not where one goes for a casual stroll. In fact, I doubt there are many topics in the wine world right now that can match the amount of passion on either side of the debate. There are a few firmly in the “for” camp (notably Isabelle Legeron, and Alice Feiring) and several in the “con” camp (notably Tom Wark, Tom Wark, and Tom Wark). At the risk of oversimplification, the proponents of Natural Wine believe that there is far too much technological and chemical manipulation in “standard” wine making. “Natural Wine” is a step beyond both organic and biodynamic winemaking in that nothing is added or removed during the process. No matter what one may (or may not) think about the whole debate, it is clear that those on the opposing ends of the continuum have rather firmly held opinions and are not shy when it comes to disparaging the other side. There are two main problems, as far as I can tell, in the Natural Wine debate: 1. There is no real definition of and certainly no certification process for Natural Wines, and 2. Some proponents of Natural Wine have less than nice things to say about non-Natural Wine producers. With all of this as a back-drop, I pulled into Old World Winery on a particularly cold, dark, rainy day. I entered the tasting room, which was bustling with activity, soon, Darek emerged from the back with a hand-truck piled high with cases of wine, which he politely whisked by me out the front door. Darek Trowbridge (from his Twitter page). When he returned, I knew that I might have a problem with Darek; not only did he have a nice crop of hair, but he looked to be about three days in to a full-grown beard. My hair has not looked that good since maybe that one day in the eighth grade and I have never been able to grow a beard (although there have been two notably pathetic attempts). Darek was rushing off to a tasting in the city, so our time was limited. He did walk me through a few of his wines, however. Seeing that this was my first real exposure to a Natural Wine proponent (truth be told, he does add a little sulfur to stabilize the wine a bit before bottling) so I was expecting that we would dive head first into the debate from the jump. I guess that is just his style. The day I was there, the Winery was just finishing a rather significant sale, hoping to clear out some wine for the new vintages coming in. 2009 Old World Winery Dry Creek Valley Chardonnay Carraro Vineyards: Retail $22. Kyle allowed for 18 hours of skin contact to pull put more flavors. Honeyed nose a bit of sugar on the palate. Fun to drink and a different take on Chardonnay. Very Good. 2009 Old World Winery Fog Line: Sale Price $99/case. Darek made this wine for five years and this is the last vintage. For the price? Tasty and fun this is really nice. Very Good to Outstanding. 2009 Old World Winery Syrah: Sale Price $99/case. Funky nose upon opening but the palate is undeniably tasty. If there is any more left? Buy. Very Good to Outstanding. 2013 Old World Winery Abundance 1890 Block: Sale $35.75. Reg $55. Six grape field blend (Muscadelle, Abouriou, Zinfandel, Monduese Noir, Trusseau Gris, and Chasselas) that was planted in 1890. Great flavors and ripeness but grounded in an earthiness that resonates. Outstanding. 2013 Old World Winery Flow: 100% Mayacamas Syrah: $40. Crazy nose of really tart cherry. This needs some time as the tannins are still quite prominent. After a few years? This should be a doozy. Outstanding potential. 2013 Old World Winery Arbourious: 100% Arbouriou. An old block that he inherited from his aunt. Floral nose mostly rose with some very dark berry fruit. Tart and herbal. Tastes like an aged old world wine. Outstanding. This entry was posted in Arbouriou, Chardonnay, Chasselas, Mondeuse Noir, Muscadelle, Syrah, Trusseau Gris, Wine, Zinfandel. Bookmark the permalink. My belief is always keep an open mind (and palate)! Now what fun is that? 99 / case for that good a wine, please send to Singapore!! Any more ideas on your style? Seems to me that writing that resonates the best is the stuff that comes naturally, it evolves as we grow with it. I have been thinking a bit about it, but I am not sure I have come up with anything concrete. Maybe “restrained stream of consciousness”? More wine options, more fun! More is generally better, except in things like war, cancer, and Justin Bieber. I visited Darek a couple of years ago during a Santa Rosa Wine Trail event. Loved, the Arbouriou which was quite memorable. Also enjoyed his other wines. Great guy too! Yeah, I was only with him for about a half an hour, but he really did seem like a great guy. And yes, that Arbouriou was fantastic! Your use of the word “conversation” (a few paragraphs after you were asked about your writing style) suggests the best word I can think of to describe your writing style: conversational. That is why I follow your blog, even though I’m not a wine connoisseur. If you’re a good writer, you’re a good writer, no matter the subject! I might have to steal that from you! Thanks as always for the kind words! I agree with mistermuse on your writing style! Definitely conversational. I started following your blog due to the OMYGOD series, but have seriously started trying out new wines after following you and Michelle and Odedi. And I’ve definitely learned something from all of them! 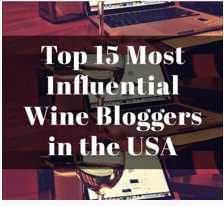 So kudos to all the wine bloggers! And us you! Whenever I am at a loss as to what to make for dinner, I dial up and peruse your blog for ideas. Tasty suggestions, most of which I can actually come close to puling off! I had no idea how to respond–maybe laughing is the route to take! Great notes… Such a useful post for me! Thanks, man!